In an ad, one Internet user with the name of "Aniesh" put up an ad to sell the office building for a price of Rs 10,000. Sharing a photo of the building located in the Sasthamangalam area of Thiruvananthapuram, the advertiser campaigned it as a “ready to move” property. The ad has been put up by a person from Kerala and has been viewed by nearly 300 people. The Congress’s decision to spare the Rajya Sabha seat for Kerala Congress (Mani) candidate has not gone down well with party workers in the state and it has created a huge stir. And as protests and uproar grow stronger, one advertisement has taken the hullaballoo around it to a whole new level. 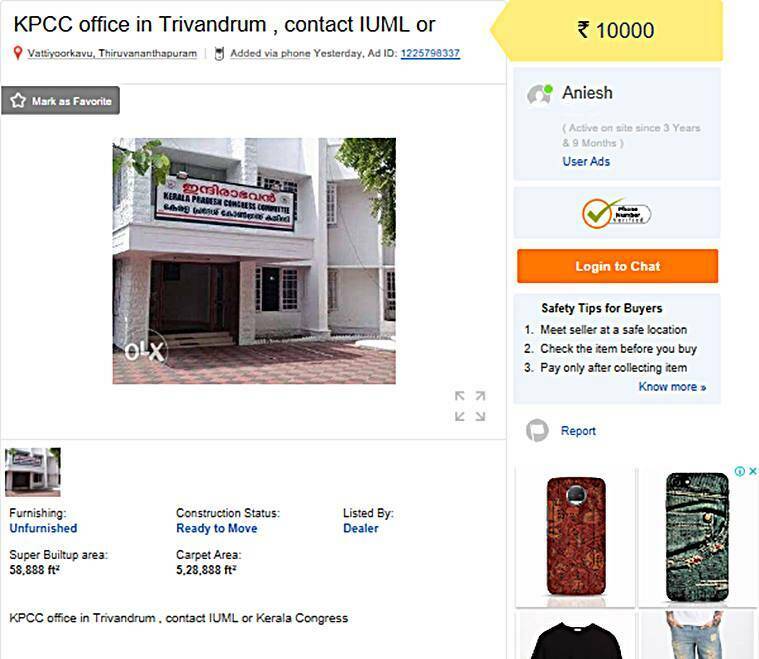 Indira Bhavan, the headquarters of the Kerala Pradesh Congress Committee (KPCC) has been put on ‘sale’ on OLX. In a sassy ad, one Internet user with the name of “Aniesh” put up an ad to sell the office building for a price of Rs 10,000. Sharing a photo of the building located in the Sasthamangalam area of Thiruvananthapuram, the advertiser campaigned it as a “ready to move” property. But what left people in splits was his cheeky description asking people interested in the property to connect Indian Union Muslim League (IUML) or the Kerala Congress (M). The advertisement is a jibe hitting out at Congress leadership ‘given away’ their seat to estranged ally KC(M) as a move that marks the return of the party to the Congress-led United Democratic Front (UDF) in Kerala a year before Lok Sabha elections. The ad was placed on mobile and has been viewed by nearly 300 people, at the time of writing. It all started when Kerala Congress was debating if veteran leader and Rajya Sabha deputy chairman, P J Kurien, should be given another term in the Upper House. Three Rajya Sabha seats from Kerala are falling vacant this month. Of these, the ruling LDF is in a position to win two and the UDF one. It was widely expected that the Congress will put up its own candidate for the seat.